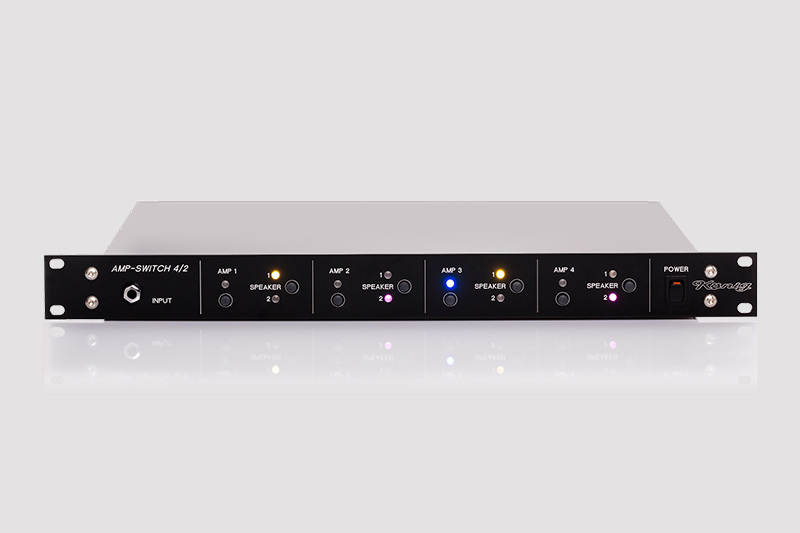 The Amp-Switch 4/2 was developed based on requests from music studios und professional guitarists in order to directly compare the sounds of different (guitar) amplifiers and cabinets. Of course, it can also be used for any other (mono) amplifiers, cabinets and signal sources. 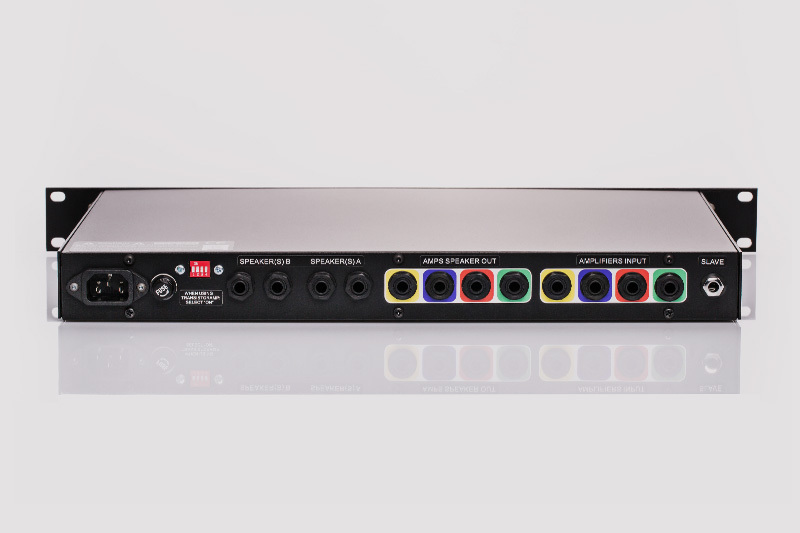 It allows the user to connect 4 amplifiers and up to 4 (2×2) different cabinets to a single signal source (mono)(e.g. guitar), and switch directly between them in order to compare their sounds in various combinations. Defining feature: Switching is passive, using high-quality relays at both the in- and outputs. The signal is passed from the input jack of the Amp Switch through a super-low-capacitance coaxial cable to the relays for the amplifier outputs. The inevitable effects on sound quality are thus essentially limited to the quality of the cables connected to the unit’s in- and output jacks. Connected tube amps are protected by short-circuiting the speaker output when they are not connected to a speaker enclosure. This option can be turned off with a switch on the back of the Amp Switch. Connected amps with high “Gain” and “Volume” settings are thus protected from damage. When switching between amplifiers, a mute function is activated to ensure that no switching click can be heard. All switching possibilities can be directly switched in real time from the front panel. Speaker selection (1 or 2) can be preset for each amplifier. Up to two speakers can be connected to each speaker output channel (parallel connection). Tests will be carried out in the near future by the relevant trade journals and will be made public here.